There is a wide range of accommodations available in Vieux Fort and the south of St Lucia, ranging from cheap & cheerful beach huts at The Reef to several guest houses, private homes, apartments, beach front cottages, luxury villas and even a 3-star all-inclusive family resort. And if you don’t mind a 45-minute drive, you will also find several of the world’s best luxury boutique hotels in Soufriere on St Lucia’s iconic, west coast (a UNESCO World Heritage site), i.e. Jade Mountain Resort, Anse Chastanet Resort, Sugar Beach Resort, Ladera Resort and Hotel Chocolat. Closer by (just 10 minutes from Vieux Fort by car, taxi or local bus) is the fishing village of Laborie: a hub of village-based tourism. 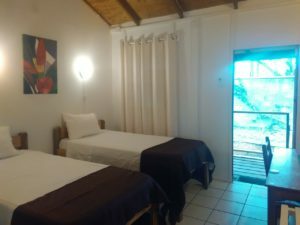 For a reasonable price, you can stay right in the heart of Laborie: in a home, apartment or cottage owned by ordinary St Lucians happy to welcome you into their homes and community. Laborie is one of the nicest, friendliest and safest villages in St Lucia. It has a long, soft Caribbean beach and lots of local little restaurants, rum shops and bars, a monthly fish fry and ‘street jump’ party frequented by locals and visitors alike, a lively arts and crafts culture. Below are our long-standing partners providing accommodation to wind- and kitesurfers, their friends and families, close to the kite beach and The Reef. Located directly at the kite beach! 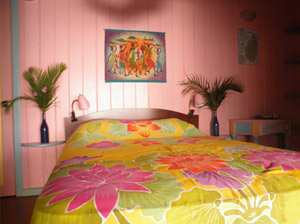 The Reef Beach Huts offer simple accommodation on the beach, right next to The Reef Kite & Surf. Built in hardwood, there are 4 rooms in total. Each room is 4 by 4 meters in size, and you can get one double bed (standard-size: 140 cm wide) or two single beds (can be separate or pushed together). Each room is air-conditioned with its own private toilet and shower (hot and cold water), an electric fan, local furniture and a kettle to make hot drinks. The rooms are secure and set within a tropical courtyard on the roadside of The Reef Beach Cafe, under the seagrape and almond trees. The Reef Beach Cafe is directly on the beach. From bed to beach is just 50 steps but the rooms do not have a sea view. At night you hear the waves, the wind in the trees and all the night sounds of the tropics (cicadas, tree frogs, etc). On weekends and holidays, there may be loud music from nearby beach parties, which can last into the wee hours. Breakfast is available at the adjacent restaurant and is served right on the beach: fresh fruits, juice, tea or coffee and home-made local bread with eggs your way, ham, bacon, sausages, cheese and local jam. Chill out Caribbean style: put up a hammock and relax or get busy & wet on the water! Right on the beach, a few steps from The Reef Kite + Surf. 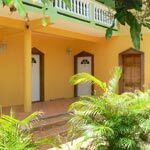 Located on the southernmost tip of St.Lucia, guesthouse Villa Caribbean Dream is built into a tropical hillside overlooking a vast expanse of Caribbean Sea, beaches and mountains covered with rainforest. 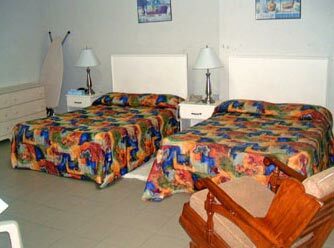 The guest wing at Villa Caribbean Dream includes 4 guest rooms with double beds, lots of closet space and a ceiling fan, two bathrooms and a small but fully equipped kitchen. 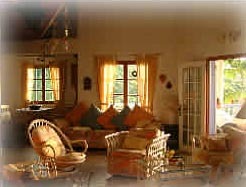 The rooms are refreshingly bright and airy, decorated in a charming blend of European and Caribbean style. You can choose to cater for yourself or have a generous Caribbean breakfast prepared for you. By appointment, a delicious Creole-style dinner can be provided also. To treat yourself to something truly special, reserve one of Villa Caribbean Dream’s ‘jewels”: the separate small cottages with private bathrooms and kitchens, a cozy ambience and lovingly created details offer a unique atmosphere. The landscape surrounding the ‘Rainbow Apartment’ and the ‘Creole House’ is just as appealing as that of Villa Caribbean Dream’s main house. Unforgettable sunsets, fantastic views of the Caribbean Sea and the right amount of Caribbean feeling make these cottages into an ideal tropical escape for honeymooners. 7-minute drive to The Reef Kite + Surf center. 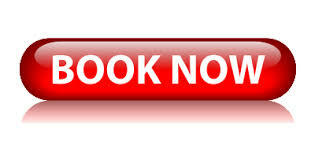 Brigitte can arrange a daily beach transfer by taxi or help you rent a vehicle. Hewanorra Gardens is a locally owned and operated business with self-catering studio apartments, offering all the comforts of home. The rooms are large, airy and clean, with comfortable queen or king size beds, airconditioning, cable TV and well-equipped kitchenettes. Located at Beane Field, just a few minutes’ away from Hewanorra International Airport, in a quiet and peaceful residential garden setting, this is a great option. On foot, it takes about 20 minutes to walk to the beach. On a rented mountain bike, it’s just a 5-minute whizz. 20-minute walk to The Reef Kite + Surf centre. Castles in Paradise is a secluded villa development nestled on a hillside high above the Atlantic beaches on the south of St. Lucia. This is an exclusive resort which is completely private and secure. Luxury, private 2-bedroom villas with gorgeous panoramic views of the Atlantic Ocean and use of the swimming pool. Located 7 minutes’ drive from The Reef and the kite beach. Two-bed villas with two double bedrooms, each with its own ensuite bathroom. Also fully equipped kitchen, living/dining room, guest toilet, balcony, laundry room, private car park, cable TV, and use of the swimming pool and pool bar. Set in tropical gardens, with good breeze, beautiful seaview. Maid service 5 days per week included in the price. Breakfast and dinner available at the pool bar on request. Discover our beautiful Caribbean island whilst staying at Villa Wellness St. Lucia: a German-owned Creole-style hardwood house with a spectacular view. Located on the Moule a Chique peninsula, just south of Vieux Fort town. This is a great place to relax and experience the healing power of the natural, tropical environment. Listen to the sound of the birds and the cool tropical breeze, far away from the stress of the city and the virtual world. 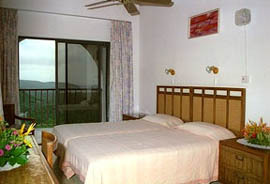 Villa Wellness Bed and Breakfast provides two cozy double bedrooms with ceiling fans, private bathrooms and fridge. From your bedroom, you can enjoy the view of the sunset at the end of the day and the moon and stars at night. At Villa Wellness St. Lucia we offer holistic healing and pampering treatments as well as belly dance and yoga classes. Tasty Caribbean style veggie or fish meals can be arranged with advanced notice. There are three friendly pet dogs in and around the house. Villa Wellness is just 10 minutes’ drive from the kite beach at The Reef Kite + Surf. A friendly, ordinary business-travellers hotel, very conveniently located on the edge of Vieux Fort town (between the local police station and the largest liquor store on island!) this is a good choice if all you need is a comfortable bed in a room with air-conditioning, a private bathroom with hot and cold water, cable TV and friendly service. It is walking distance to the kite beach (5 minutes) and town (5 minutes) and close to the international airport. Continental breakfast is included and it is very reasonably priced. Clear Sky Hotel has single rooms, double rooms and family rooms. Coconut Bay Resort is an easy 12-minute stroll away from The Reef Kite + Surf, taking you south (downwind) of the airport runway and away from the shallow reefs in front of the resort. Coconut Bay is the only 3-star all-inclusive beachfront resort in the south of the island. With 254 guestrooms and a wide range of amenities, the hotel caters to families, singles, couples and groups. 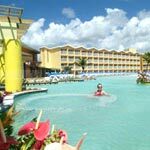 The resort is situated on 85 acres of Atlantic beach front. Each of the resort’s 254 rooms provides a garden or ocean view and features a king-size bed or two queen-size beds, a sitting area and private balcony. Room amenities include A/C, ceiling fans, satellite TV, direct dial telephone, internet, in-room safe, and bathroom with shower and hairdryer. Coconut Bay has three swimming pools and a water park with a free-form pool with waterfalls, two waterslides and a lazy river. A large pool deck surrounds a centrally located pool with swim-up bar. An intimate adults-only “quiet pool” is located near the spa, and children have their own water feature play area at the children’s activity centre. Or check with your local travel agent for package deals on flight + resort. 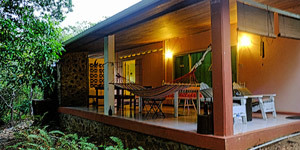 Set on the edge of the lush tropical rainforest, this small bed & breakfast is a haven of peace and tranquility. A Peace of Paradise offers budget travellers a relaxed, tranquil setting with a high standard of accommodations and services. Truly a perfect place to rest, relax and reflect. Your hostess Lorraine hails from the US and has lived in St Lucia for over two decades. She invites you to come and share her island home and enjoy the natural surroundings in this lovely open setting, nestled in the forest overlooking the Mamiku River. This tropical retreat truly offers a warm, personal touch. 20-minute drive to The Reef Kite + Surf centre. 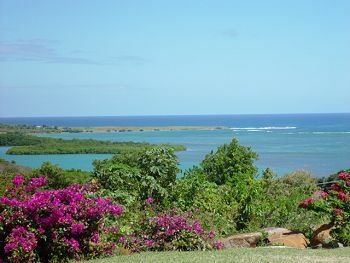 A small countryside inn, 20 minutes easy, scenic drive from The Reef Kite & Surf. The hotel overlooks Praslin Bay and the Atlantic Ocean to one side, the rainforest to the other, and Mamiku botanical gardens down in the valley. 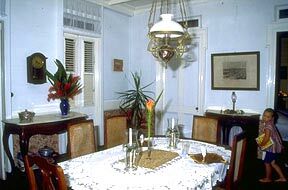 The Fox Grove Inn is owned and operated by a St. Lucian chef and his Swiss wife, and has one of the best cuisines on island. A peaceful, comfortable and meticulously run small hotel, with excellent value for money. There are twelve rooms and two self-contained apartments. Romantic 19th century estate house with several guest cottages, historic ruins, a river and a beach. Rooms are also available for rent in the main house.